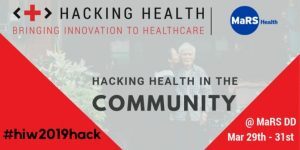 Health Innovation Week 2019 is kicking off with an exciting event hosted by Hacking Health. Join us for an action packed 3-day hackathon March 29th to 31st at MaRS Discovery District! Big Data, AI, Machine Learning, Connected Health & Aging… all topics and tech tools are on the table as we hack the issues facing healthcare in the community.